Set the standard with this glowing citrine sensation!14k ring. This ring is crafted in polished 14K gold, and features two pear cut citrines. They are in intersecting bezel settings at the center. It also features 98 round full cut diamonds in pave settings at the sides. 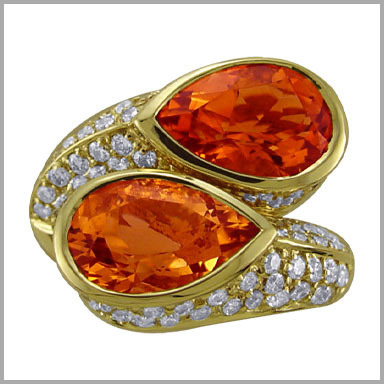 The total citrine weight is 6.00ct and the total diamond weight is 2.01ct (both approximate). The diamond color is G-H with a clarity of SI. The setting size is 3/4" x 5/8" with a height of 5/16". It has an undergallery for added beauty and comfort.